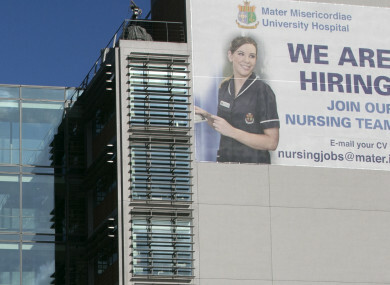 A 2016 recruitment campaign at the Mater Hospital. UP TO 35 specialised nurses working at the Mater Hospital in Dublin may be unable to work over the busy Christmas/New Year period due to apparent delays in receiving work permit documentation. Unions representing the nurses have called for the government to intervene in the process, both for the sake of the nurses involved and the provision of health services in the hospital. The INMO wrote to Minister for Health Simon Harris about the issue on 6 December with Sitpu yesterday calling on both Harris and Business Minister Heather Humphreys to intervene. Siptu organiser John McCamley said the nurses in question are non-EU nationals and have a work visa but that there is an issue with providing them with relevant supporting documents. They’ve put in all their paperwork within the proper timeframes and all that but they’re being told it hasn’t been processed as yet. Without this support letter they’re unable to work which means that their employer has to tell them to not turn up for work. McCamley says that the problem has already led to one nurse being told they cannot work and that more will be told the same unless the delay is rectified. He added that some of the nurses involved have been working within the health service for a number of years. “The difficulty is made worse for the individuals involved given the time of year and all that. It couldn’t happen at a worse time of year,” he adds. The Irish Nurses and Midwives Organisation (INMO) represents over 1,000 nurses at the Mater and says that the 35 nurses involved are in some specialised areas. Among them, lifesaving care in theatres, high-dependency units, transplant surgery and cardiology. The INMO says that administrative delays in both the Department of Business, Enterprise and Innovation (DBEI) and the Irish Naturalisation and Immigration Service are causing the issue. The union’s officer in the Mater Albert Murphy has said that they delay has put the nurses in a “visa limbo”. “It is deeply unfair to put them in this position, especially so close to Christmas. They work hard to care for patients and deserve the certainty that they will still have jobs to go to,” Murphy said. TheJournal.ie has sought comment from both the Department of Health and DBEI on the matter. Email “Nurses in Dublin hospital may be told not to turn up over busy New Year period due to visa issues”. Feedback on “Nurses in Dublin hospital may be told not to turn up over busy New Year period due to visa issues”.